First time around when you have a baby it all gets a bit confusing, there are magazine articles, lots of google searches and helpful friends forwarding on emails. All telling you what is absolutely essential for when your baby arrives and it's easy to get sucked into all the things you don't need to. Second time around it is all a bit more of a bodge job with bits you used before, lots of make shift solutions because you know the early stages don't last long, you know your child won't break if you don't have a little top and tail bowl...cos you can, you know, just use a normal bowl (huge gasp and then the realization that yeah it's all going to be ok). However the things we found really useful both first and second time around, things that really stood the test of time and even with cub I was thinking 'I'm so glad I have this, I seriously couldn't live with out it' are listed on the video. It seems my love of things of the plastic variety are normally made by Munchkin but this is in no way a sponsored post...I just think they do it right. I also loved our microwave steamer and although I loathed the whole bottle and steaming process, this made it so much easier. As always, I'm still learning as I go along with Youtube so please do let me know if you liked it, subscribe if you did and comment here (or on youtube) if you want something different / the same / or just to chat. Sometimes we have great days filled with friends and family. Other days, once Bubba is at school, the four walls can close in around me and I feel like an imposter in my own life. Especially when I'm tired and emotional after another night of broken sleep. When my boy is asleep I can feel alone, I crave conversation or just a smile from a stranger to acknowledge that I'm not invisible. Even sometimes when he is awake, there isn't always a connection and it can get boring as he plays with his toys or crawls around taking in the world. Walking down the road, he'll fall asleep in the buggy and I feel cheated and like a spare part, only there to be the hired help. I question myself and my life all the time, wishing the time away, hoping for a change where I don't feel so lonely and useful as only a mother and not as me. Time seems to be on fast forward and I'm panicked that I'll miss a moment of time and not be able to remember in a few years. I had a health scare a few weeks back and thankfully all is ok but as I sat in a stark hospital corridor in my open at the front (glamorous) gown waiting for tests, I wished for more of the boring, lonely days. It made me realise that my life and those of my loved ones are all very precious and to not miss a minute of them or wish them away, it also gave me the excuse to eat my way through the next week or so with a 'sod it, I'm celebrating' attitude and I'm now paying for that in pounds of weight! I've decided to document more of our time together by making Youtube videos (you lucky lucky lot!!...ps. I'm still truly awful at it but at least I'm trying hey) and writing down what's going on because if anything happens to me then I want/need my babies to know that I was there for them and we had fun....or not but that we live a rich life punctuated by brilliance amongst the mundane. So this is a sort of rambling post to let you know that there will be videos up here more and please don't cringe too much at my oversharing. It's also to remind me that although I get lonely and feel like I have no real purpose, on that day when I thought I might have cancer, I would have given the world for more lonely and drifting days, anything to keep me with my children and living the life I really do want to live. So seize the day and all that, live a life that is inspiring (to yourself and your loved ones). And just to prove how rubbish I am...here is a lovely video. Who knew I talked like that and do I really look like that?!? I know when considering having your second child, your first was at that adorable age and your hormones ruled the world. You through rose tinted, child finger print smeared goggles thought it was going to be a breeze (you know...cos you've done it all before) but now realise it's not! Never fear, you will get through this 'phase' of sheer hell that's presented itself. Your toddler may hate you right now and be throwing some award winning tantrums (mine lovingly told me she hated me at every opportunity whilst trying to trash the house...her favourite thing to do was kick the front door or car door yelling "let me out, I hate you mummy" the last few syllables would go up an octave or two). Your first born will quickly learn to embrace the new arrival - sometimes quite literally and your favourite phrase may be "don't squeeze your brother/sister too hard" or "no, no...let him go now, he's going a bit red" as her hands clamp shut around his head/neck/leg* *insert relevant body part. But this is a good sign, honest it is. It's all part of the bonding process. Your body may resemble a pile of spuds in a sack and you can't remember (or care) when you last shaved anything!!! But this will change so stop worrying that even six months in, your clothes don't fit. Maternity chic can last well into your first year (or second or third...). Stretch waist is one of life's pleasures. You will get some motivation back and chasing after two little terrors can do wonders for your waist line. Be gentle with yourself when all you want to do of an evening is sink into a bottle of wine or you are asleep by 8pm. This is normal and part of the healing process. You, like your newborn will be able to stay awake longer the older the baby gets. Your ability to play rubbish games with your toddler whilst the baby is napping will get better without you screaming in your head over and over again "I should be asleep now, I should be asleep!" The desire to have another baby, yes I know you've only just had one but those pesky hormones get in the way, will ease off once your baby becomes mobile and sleeps less and your toddler learns more complex ways to get an emotional response from you. Please don't jump head long into that 'god I love kids and want loads' mentality too soon, enjoy your littles as they are and then once you are getting more sleep think about getting less again! Above all, drink wine, eat pizza and enjoy your children, hopefully they will develop a very strong bond (of course they will) and remind yourself that they can, in the future, entertain each other and look after you in your old age. Mostly just remember, this is all just a phase! 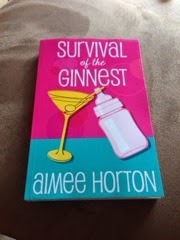 I love what blogging can do and where social media can take you, I was a lucky blogger to get the chance to review 'Survival of the Ginnest' by Aimee Horton, I already read the original book on my Kindle and loved it (and my claim to fame is that Aimee had my review quote on her business card, I even hunted her out at Britmums to tell her who I was...stalker? me? never!!!). Now the book is out in paperback...go find Amazon right now and order it...go on...I'm waiting! I got mine delivered on a Sunday no less - good work Amazon even if you did deliver to someone down the other end of our road. It's so lovely to actually hold the book in my hand as I've watched on various social networks Aimee's book journey...please Aimee if you are reading this, I really am NOT a stalker. Anyway back to Dottie - the brilliant and normal main character, her story is told by a series of Facebook status updates which follow her as she turns from a 20 something into a fully fledged mother. It follows her changing and learning about being a mother, it's fast paced and witty and the situations she faces are very realistic. "Dottie Harris is having to hide her McFlurry down the side of her seat while she sneaks spoons as there is NO WAY she's sharing it." I find this book so easy to read and I've been catching up on it as I sit on the stairs waiting for my daughter to go to sleep as she shouts at me to make sure I'm still there. I am a real social media junkie so this immediately appealed to me and I can dip in and out as my bum goes numb on the stairs. "Dottie Harris thinks tonight is going to have to include alcohol and naughty food of some variety. If they all make it through bath time alive, that is." Dottie is such a likeable character and I often think she would be a brilliant friend to have and why can't she be my friend? I must admit sometimes I can't read this book because it feels too real, like when Dottie's little monster isn't sleeping or is ill...I have had to skip bits because we too are suffering similar at the time and it feels so close to what I'm going through. Other times I like to revel in Dottie's gin drinking and the fun times. I'm an incredibly hard critic when it comes to books, if I don't like it then I can't read it and once I've read a book I can't go back to it but Dottie is so easy going that I've now read it three times. "Dottie Harris is reminding herself that her children are lovely, and she can't leave them outside, free to a good home." I cannot wait to read more from Aimee and if you need a fun holiday book to read then this is a good one to go for, I'm going to recommend it to all the women I know. When I found out the challenge from Petits Filous was to Mix up the magic on playdates I thought I knew exactly what we would do. Since the weather has been awful around these parts recently and my girl is constantly asking to go to the beach, I thought we'd mix it up and bring the beach indoors for a change. We made a list of all the things we'd need for the beach and top of her list (surprise surprise) was ice cream. We set about making our own with the Petits Filous Magic Squares desserts. We opted for the Strawberry and vanilla flavour but they also do raspberry and vanilla. They come in jazzy little pots that we are saving to make some other craft projects (but not entirely sure what yet). When we first opened them, Bubba was fairly mystified by the cute little squares of choice and dived right into the strawberry flavour, being careful not to disrupt the rest. Then we made some flowers to freeze and she didn't care that she was mixing the flavours and (much to my horror) filled them with wild abandonment...I tried hard to contain myself as it all slopped over the sides! We then frozen them overnight ready for our beach scene. But as you can see, they turned out lovely and are a bit easy to eat - I too was scoffing these whilst the kids played. I can happily know that they (& I) are getting a fix of vitamin D and Calcium to support their bones and my healthy appetite! Note the little hand trying to drag the pot of frozen flowers away as I was taking the photo. So back to our beach, I put the paddling pool that Bubba got for Christmas and is yet to use in the garden, in the living room. We filled it with balls and I put sheets out for the sea and sand, added a deckchair and towel to lay on and it was as if Bubba was at the beach. Cub unfortunately took it upon himself to rampage about and try and mess it up (hence why the beach and sea look a bit crumpled). They both loved it and played happily for ages, there were squeals of delight and it was great just watching them play together and Bubba using her imagination to make the scene come to life, it really was magic. Today we managed to get outside after partaking in another Magic Square (can you see the little person trying to take his sisters one...she actually fed him which was lovely to see them sharing). We spent some time in the sandpit so it was our beach weekend completed and she has already asked if we can make another beach this week. 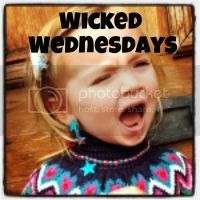 We have a few more play dates this week and I will be sure to take some with me because as well as being nice, these manage to keep the children transfixed for five minutes and hey five minutes in my world is rest enough for all of us. We live in a society where we are fed through a variety of media channels the idea of perfection. Things are just not enough being 'ok' these day's and I must admit I'm a bad offender in the 'if only' category. I always assume every one else is having more fun, getting more done and giving back more that I do. I see a photograph of a family on a day out at the weekend whilst we are pottering around the house and feel guilty that we aren't doing more. My internal voice is always saying "well if only you lost weight, earned more money, looked prettier, had a bigger audience for your blog..." Insert all manor of if only a here because I could go on and on and on. But you know what, even if I had all those things it still wouldn't be enough. I lost 2 1/2 stone and reached a weight goal a few weeks ago that I thought would make me feel like I'd made it. I'm really happy but now my if only has shifted to "if only I could tone up" because the mile stone I thought was where I wanted to be just didn't seem enough and my clever body has left me with a mummy tummy as a reminder of what it managed to do. 'If only' is such a damaging saying and my love of Instagram doesn't help, a glossy view of life is shown (by all of us both consciously and unconsciously) as you don't tend to take pictures of the messy room but rather the piece of cake arranged nicely and photographed from above on the lovely tablecloth. It's easy not to see the background of a scene, a person and a family. I often feel ashamed that I feel lacking in some areas and can't just enjoy what I have, when I have it. I'm beyond lucky and blessed and there is always someone else who has less but is enjoying life more. My little family is incredible in every way and one day I will look back and think 'wow I had it all back then'. But look at these faces - no one is looking in the right direction, all I can see are my faults and my babies are moments away from trying to wriggle off my lap. Despite all the imperfections, this is one of my favourite photo's as it's what my little family is all about. I thought I knew all about Sudocrem because I've been using it for over four years now and nothing beats it for my babies nappy rash (& the odd spot for me). So when we got to try the Sudocrem care & protect I was expecting much of the same. The difference in this is that it's a liquid in a squeezy bottle and right there and then I was sold. It's light and slides on the skin so easily and smells really good too. It had always been my bugbear with a pot, I hated double dipping if I'd already touched the pot, his bum and then the pot again. Now that's not even an issue. Phew (sorry for too much information there). Also this is a little different in that the ointment is designed to provide triple protection: so it is a protective barrier to nappy rash, it also contains vitamin E and B5 to keep the skin in tip top condition. You can really feel the difference and it soaks into the skin straight away and leaves it smooth. The other big difference is that this isn't a reactionary ointment but something to use at every nappy change to provide a protective barrier. I love that it's not messy and I'm not getting cream everywhere and it's not being used only when there is already a problem. My poor boy has suffered a lot lately with his teeth and the ongoing (it seems) teething, on bad days he has an acid bot (I know, TMI again!!!) and can have about five soiled nappies a day - so his poor little bottom can be left all red and his rash is fairly bad. We've used the ointment for over a week now and it's definitely soothing and kept his nappy area looking more normal than it has in a while. The boy doesn't seem to mind it either and it's keeping the nappy rash at bay as well. The little tube keeps him busy and from wriggling away whilst having his nappy changed. Another bonus. I'm no beauty blogger, I'd even say I got to the party a bit late on the whole make up and skincare vibe. In my twenties I wore make up every day and lots of it when I went out clubbing or to the pub, it has only been in the last year that I fell off the band wagon and stopped using makeup. Not having time was a big factor once I'd had cub but it was also because my skin just erupted into a hormone induced spot frenzy, so I just sort of gave up on it. 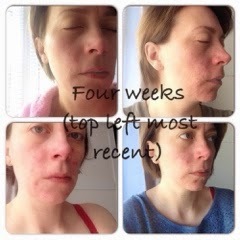 My skin has never been brilliant, I've always had spot prone skin but now I have adult acne and it can be very debilitating sometimes. I can't cover it up with make up all the time and so I try and shy away from public situations and keep my head down. I have been using Liz Earle for over 15 years and I love the Cleanse and Polish hot cloth system but I'm not sure if my skin just got used to it or needed something more so I decided in January to try and sort my skin out this year. I saw the La Roche-Posay starter kit in Boots and decided to invest in it, and with high hopes I started using it in early January. Being used to the creamy texture that Liz offers you (it feels like being licked by fluffy little kittens...see told you I wasn't a beauty blogger!) this felt harsh and drying on my skin. So in true Karen fashion, I tried this for about four days before I resigned it to the cupboard and went back to Liz again. By late February, my skin was the worst its ever been and I had acne scaring and active acne on my cheeks (right one being the worst), around my chin and jaw line (hormones I hate you sometimes) and on my forehead. It was really really starting to get me down and I glanced into my cupboard and spied the 3 step system again and dug it out. I now have been using it every day for the last four weeks and my skin has got so much better, I still get spots (I hate that at almost forty I have the skin of a teenager) but my skin isn't as angry as it was and I can cover with make up more now. I put some pictures up, they are purposely fuzzy and small and really don't show the extent of my acne but I couldn't bring myself to expose my skin for the world to see here. Top left is my skin now and I can see such a real improvement (you'll just have to take my word for it) I just can't show you close up. It's getting better and I'm going to keep using this system in the hope it helps.